Home > Guitar News > Learn Sweep Picking in 100 days? Give it 100 is a site which challenges people to learn a new skill in 100 days. For example is it possible to learn to sweep pick in 100 days? If you are looking for something inspiring to give you the incentive to try harder on the guitar then check out this guy as he endeavors to learn sweep picking in 100 days. Now some of you may have read that I set myself some guitar resolutions at the start of the new year. One of those resolutions was to learn something new on the guitar every day. But judging from the video below I might be better off focusing on perfecting a single technique to get it absolutely spot on. The video shows a guitarist who admits to not being a novice on the guitar but professing to be fairly poor at sweep picking. He then sets about trying to perfect the technique of sweep picking over 100 days. The video was up-loaded to the Give it 100 website. 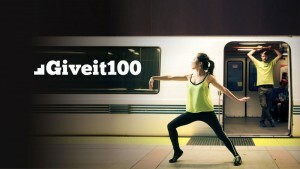 The idea behind Give it 100 is to inspire people to take on a challenge and master it in only 100 days. The type of challenge that people have chosen are varied and range from losing a certain amount of weight, to teaching themselves to dance to even learning to walk again. The site is designed to challenge people to challenge themselves and at this time of the year when people are making and breaking resolutions it is quite inspiring. But back to the guy endeavoring to learn sweep picking in 100 days. The video starts at day 1 where it is quite plain that he is no expert at sweep picking. Follow the video through and you can really feel the frustration he feels as he tries to get his picking and fretting hands to do what he wants them to do. Finally on day 100 we are treated to a rendition of some pretty flawless, and quite impressive, sweep picking. I must admit my sweep picking is nowhere near as good as this guys! So now I am going to give it a go. Can I learn to sweep pick like this in as little as 100 days? Just have to give it a go. Washburn Parallaxe PXS29FRT – When 24 frets won’t do!